The Green Aracari is a toucan with a forest green back, wings and tail. Its underside is bright yellow and there is a red patch on the rump. The head is dark blue with a red and blue patch around the eye. The big bill is tricolored; yellow on top, dark blue on the bottom, and red in the center. 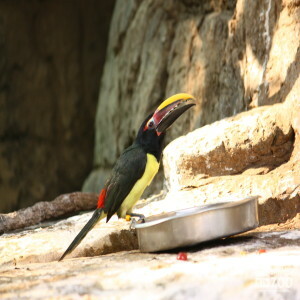 The Green Aracari has a length of about 35 cm. The dark blue head is only on the male while the female head is russet colored.